I don't know if every one else has this problem but the more half finished models I give away because I haven't got the time or the motivation to finish them the more that seem to turn up on my "TO DO" list!! My current list consists of 15 fixed wing and three helicopters. Of those I only have 2 fixed wing and two heli's that are currently flyable! 2. 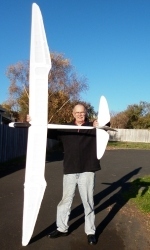 A 104 inch, power assisted glider. OK you say, fair enough, but what about the other 13 fixed wing models and the one Heli? Errrrrrr, Ummmmm, that is where the rot sets in. I have 4 models that need repair because they had an unfortunate encounter with that shameless hussy called Gravity. In one case Gravity was assisted by one of those evil jumping trees. 4. A 94 inch Senior Telemaster that decided to shed some of it's covering in flight! - Reason yet to be diagnosed but yes I did use "Stick It " (similar to Balsaloc) and it is a quality brand name covering. I haven't yet worked out how to blame Gravity for that repair. 2. A 76 inch Aero Commander - more than 24 months! 3. A 90 inch Lancaster - not sure but around 2 years! 4. A 76 (?) 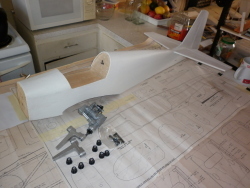 inch Mosquito - been planning it for a long time but just started the build 2 weeks ago. 1. A Bird of Time that started life as an electric powered ARF Glider and ended diving in from around 200 feet when a servo link failed. The owner was adament that it could not be repaired. It's almost ready to fly again as a pure glider. Restoration time so far 97.5 hrs. 2. 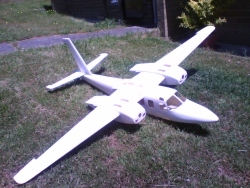 A "something vaguely like" a Fokker EIII monoplane that I built many years ago. The model surprised me and flew very well so I decided to "detail it up". It then got damaged in a move and has sat at the back of the hangar ever since. One day I intend to rebuild it and do the dressing up. Every so often I put it down off the wall and think about it. Restoration time so far about 15 hrs. 3. The Harvard/Texan to Wirraway Conversion. Yep, I have a 90 inch Harvard/Texan that I'm rebuilding as a CAC Wirraway. Because I have a particular attachment to this aircraft I'm doing a "super scale" restoration. Restoration time so far 617 hrs. 4. A 90 inch Chinese ARF P38 Lightning. 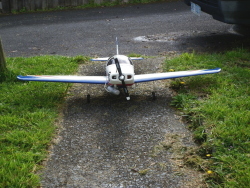 I was silly enought to swap my good Ugly Stick float plane for this kit which is a nightmare. The only way to recover something from the kit is to completely disassemble it and rebuild the bloody thing straight and true. So far I've stripped it down and it is waiting it's turn. Don't hold your breath. Restoration time so far 4 hrs. 5. A very large 3D model powered by an ASP108 glow engine. I bought it off another club member for virtually the price of the propellor!! Why ? Well it was a bargain and now I'm not even sure what I'm going to do with it. It does need restoration though and a bit of a redesign so it's on the list - and has joined the other models on the waiting wall. Restoration time so far - still thinking about it. If I was into a full confession I'd admit there are a couple of other models or projects lurking around as well but the only other one I'm admitting to at this stage is the Kalt Space Baron restoration - yes - that's right - I have two. One flies - this one doesn't as I recovered it from the rubbish tip. It is restorable and that will give me a pair of vintage IC engined Kalt Space Baron Helicopters!! Time I've spent on the heli restoration - counting chasing parts? around 150 hrs.